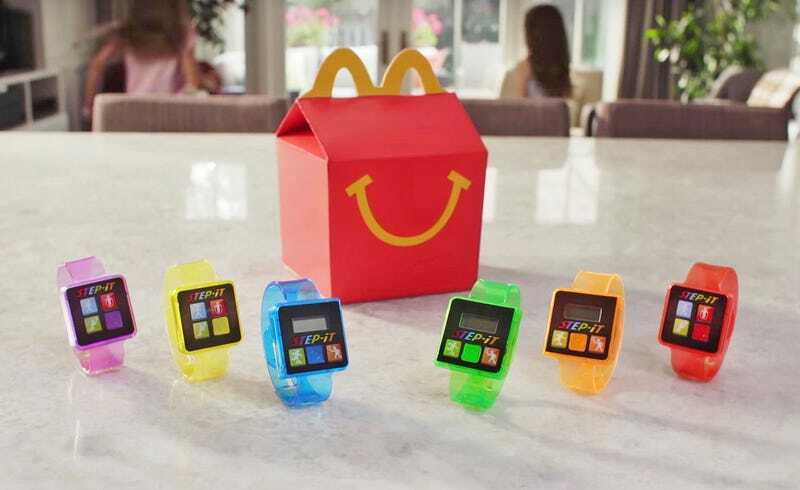 McDonald’s will no longer be shipping fitness trackers with its Happy Meals. The fast-food giant is discontinuing the cheap step-counters it was set to include in kid’s meals because the plastic bands are giving children rashes. The Happy Meal toy was announced earlier this week, and it was set to be available for four weeks during McDonald’s big marketing push for the Olympic Games. Now, the golden arches will go back to shilling greasy food to children with the help of cartoon characters and other big franchises. As we previously reported, the step-counter was kind of a bad idea anyway. A cheeseburger Happy Meal is loaded with 840 calories, meaning it would take the average kid about 4 hours of exercise to burn off. If the average person takes 2,000 steps per mile, and walks about 3 miles per hour, then they’d have to take 24,000 steps before all of the cheeseburger calories burned off. Gross. We’re just glad this experiment is finally over. First of all, the fitness tracker was of dubious actual utility. But more importantly, it’s a real distraction from the very real problems with fast food. If you want your kid to live a healthier life—stop buying them McDonald’s. It has almost no nutritional value and can lead to long-term problems like diabetes and obesity.